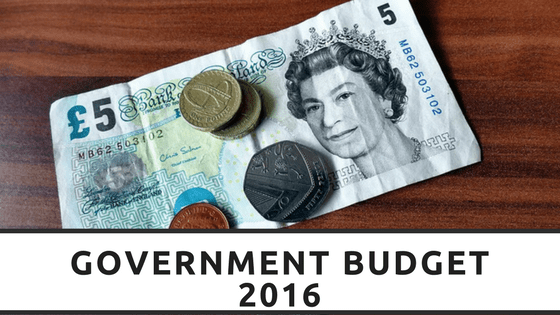 Government released Budget 2016. How does it affect you? Last week saw the new Budget announced by the government and with it comes a lot of changes that could seriously benefit people with in business. No matter what industry you are, employees or just you, the changes could mean a big difference with such things as tax changes, threshold increases and even the end of Class 2 National Insurance contributions. We have looked through the Budget and picked a few of, what we feel are, the most imperative changes to small businesses. The Government have chosen to increase the current personal allowance to £12,500 and the higher rate threshold to £50,000 by the end of this parliament. Starting with increasing the personal allowance in 2017-2018 to £11,500, higher rate to £43,000 by April this year and then £45,000 by 2017-18. This means that the average employee on National Minimum Wage working 30 hours a week will not have to pay income tax in 2017-18 and there will be 585,000 fewer higher rate tax payers since the start of this parliament. An unusual one in relation to business but the government plan to introduce a levy on soft drink producers and importers, the funds raised will then be distributed in to the school system by providing up to £320 million per year from 2017 to help schools support healthier and more active lifestyles. Up to £285 million a year provided to 25% of secondary schools to increase the school day in order to include a wider range of activities including more sport. Finally £10 million per year to expand breakfast clubs in up to 1,600 schools starting September 2017 to ensure pupils are receiving a nutritious breakfast. If you happen to run sports programmes or wrap around care for schools this may be of interest to you, offering you an added avenue in which to market your services. The government announced in the Autumn Budget 2015 an introduction of an apprenticeship levy. This has once again been mentioned in the Budget 2016, with employers receiving a 10% top up of their monthly levy contributions in England which will be available for them to spend on apprenticeships training through their digital account. Further details on the operating model will be realised in April with details on the funding rates published in June. The government are seeking advice from an external independent stakeholder group and will offer new peer and specialist support for those suffering from mental health conditions and young disabled people to help them get in to work. A White Paper will be issued later this year with more details on the roles to be played by Health, care and welfare sectors in this reform. Although there has been increase in women returning to work after having children there is still 90% of women who haven’t due to caring for family or children and 1 million who want to work but cannot due to these situations. The government intend to launch a consultation in May 2016 on how to implement its commitment to extend Shared Parental Leave and Pay to working grandparents, with hopes to streamline the system and simplify the eligibility requirements, with intentions of using digital technology. From Early 2017, the government will introduce Tax-Free Childcare to help working parents with the cost of childcare. Allowing more parents the ability to go back to work when they are ready and increase the number of hours they can possibly work. It will be rolled out with younger children enrolled in to the scheme first with all eligible parents brought in by the end of 2017. This will sit alongside the existing scheme Employer-Supported Childcare until it closes in April 2018 to support the transition between the schemes. It will also sit alongside the doubling the childcare entitlement from 15 – 30 hours for working families with 3 and 4 year olds from September 2017. The mandatory National Living Wage will come in to effect 1 April 2016 at £7.20 for workers aged 25 and above. There are hopes that the National Living Wage of 60% of median earnings will reach around £9 in 2020. The government are hoping for lower taxes for everyone by aligning tax treatments and imbalances. Up until now employer-provided benefits are taxed more favourably than cash salaries and the self-employed pay lower taxes. The measures in Budget 2016 will aim to treat different forms of income in a similar way to fund a fairer more sustainable tax system for everyone. The Government is considering limiting the range of benefits that attract income tax and NICs advantages when provided as part of a salary sacrificing scheme. However pension saving, childcare and healthcare benefits will continue to benefit from relief when provided through salary sacrifice arrangements. These are just some of the changes proposed for working people. Come back next week when we have a look at the changes the government hope to implement to support businesses, enterprises and the self-employed. For more help understanding what these budget changes could mean for you and your business, or want tips on how to take advantage of them please get in touch with us by clicking here.